Much has been written about David Carr — as a writer, memoirist, editor, friend, mentor, reporter, and critic — and rightly so. He was a man of many parts. I come to praise him for his last new venture: Professor. When David died, he was the holder of an endowed chair in the Journalism Department at Boston University. There he was, inventing himself all over again. Far from the places in Washington and New York where he had made his bones, David was putting himself on the line to try something new. And he was not just dabbling. He took it seriously, and from what he revealed, he was dead-serious about teaching. He saw teaching as another way to do most of the things he cared about — writing, thinking, criticizing, and nurturing this thing that we all care about so much. David came to our attention early. Back in 2012, we were given a new chair in Journalism by a generous graduate of BU — Andrew Lack, a veteran news executive at NBC and Bloomberg. Andy wanted to use his donation to let us hire a professor who would be engaged in the big, noisy debate over the future of quality journalism. Specifically, he wanted to pay for a professor who thought a lot about the evolving economics of news. Almost from the get-go, David was on everyone’s wish list of people we hoped to attract. In fact, in an early meeting, Andy Lack, said he envisioned the position as one where the professor would be on David Carr’s speed dial for comment about the news business. It was a short step to think: why not David Carr himself? A little while later, good news: Andy Lack had bumped into David Carr and mentioned the position to him, and he didn’t say no. We were all very excited. He was at the top of our field, and he had more than 400,000 Twitter followers. What else could we want? But in academia, we have procedures that we must follow, and searches for new faculty come with more rules than the NFL. (Going back through my email, I can see 304 entries in a folder called “Lack Search”). We advertised for the spot, and we got in the low hundreds of inquiries. But one got our attention: David Carr actually applied. Beyond my professional and educational experience, I’d like to suggest that my steady history of outperforming expectations in every job I have had makes me worthy of consideration. I’m a thinker, a journalist and a writer but I am also a worker, an earner, and a good colleague. I am reflexively loyal and ferociously represent the interests of the people and institutions with whom I affiliate. While my teaching experience has been episodic, I have consistently given freely of what has been given to me by others who have shown me the way. I was taught that truth matters, fairness matters, excellence matters. Those values are relevant even as the skills required to prosecute journalism morph to meet a changing media landscape. . .
My intent is to establish a line of academic inquiry in class that is both participatory and observational. Whenever I spend time with students, I emphasize that they have to make things. The employment marketplace is far less interested in a prospect’s grade point average than what he or she has created, which historically been a clip from the college newspaper, but now takes many other forms. Since the students and I would be spending three hours together each week, I’d like to establish a parallel track of media creation and distribution. Apart from providing object lessons in using tools at hand to make things, the production and execution would give me criteria to evaluate and grade students’ understanding of the subject matter. . . . In spite of my lack of a steady teaching position, I believe I have some relevant skills from my time as an editor and reporter. I took the liberty of attaching some letters of recommendation that I solicited and am proud of the fact that many mention a consistent history of finding and mentoring exceptional young minds. Should you and the committee decide that I meet the expectations for the position, please know that I would work with the students, faculty and leadership to ensure that the college’s reputation for academic rigor and practical excellence only grows during what I hope would be a long and fruitful association. . . I asked him: why teach? He explained that in recent years, he had been asked many, many times to appear as a guest speaker in college classes. He accepted as many as he could, but it had begun to wear on him. He said there was a lot of travel time involved for a 45-minute appearance, and he wanted to improve the ratio of schlepping to speaking. Not only that, but he felt he was spreading himself too thin. He’d like to try his hand at developing a whole course and find out if he really had anything to say. Besides, he said, he had worked as kind of a professor for much of his career — as an editor, he was famous as a spotter and developer of talent — and he had a genuine stake in the success of younger people he had brought along. David also submitted more than a dozen of the most amazing letters of recommendation I have ever seen — from colleagues, from younger journalists he had mentored — all over the moon. Of course, we hired him. As far as I know, he only presented one real demand: He insisted on keeping his column at the Times, which suited us just fine. He would commute to Boston on Mondays, teach that afternoon, then stay overnight and be on-campus for most of each Tuesday as well. And, of course, the students loved it. David brought much to the classroom, but still he was nervous about his own first course. I offered him some practical advice and lots of encouragement, but he really invented himself as a professor. After a period in a cocoon, out popped this amazing, brightly colored new species. His firstsyllabus became an instant classic. To begin with, we will look at the current media ecosystem: how content is conceived, made, made better, distributed, and paid for. We will discuss finding a story, research and reporting, content management systems, voice, multimedia packaging, along with distribution and marketing of work. If that sounds ambitious, keep in mind that in addition to picking this professor and grad assistant, we picked you. We already know you are smart, and we just want you to demonstrate that on the (web) page. I grade based on where you start and where you end. Don’t work on me for a better grade — work on your work and making the work of those around you better. Show industriousness and seriousness and produce surpassing work if you want an exceptional grade. This is an intense, once-a-week immersion on the waterfront of modern media-making. If you don’t show up for class, you will flounder. If you show up late or unprepared, you will stick out in unpleasant ways. If you aren’t putting effort into your work, I will suggest that you might be more comfortable elsewhere. If you text or email during class, I will ignore you as you ignore me. It won’t go well. I expect you to behave as an adult and will treat you like one. I don’t want to parent you — I want to teach you. . .
Students spend hours scrutinizing their professors, and they are pretty shrewd judges. David’s students came away knowing that they were lucky. They got the privilege of spending a whole semester with a brilliant man who really cared about them. He walked into the class shyly, his head bowed as it always was. He had prepared what he was going to say, as he would for every class, his fingers scrolling his notes on his red I Pad. I had waited to meet him for years and could not believe that he was teaching me. At first he wasn’t a great teacher, dispersive and chaotic. But he got better, he taught himself to be better, and when needed he asked his students for advice. 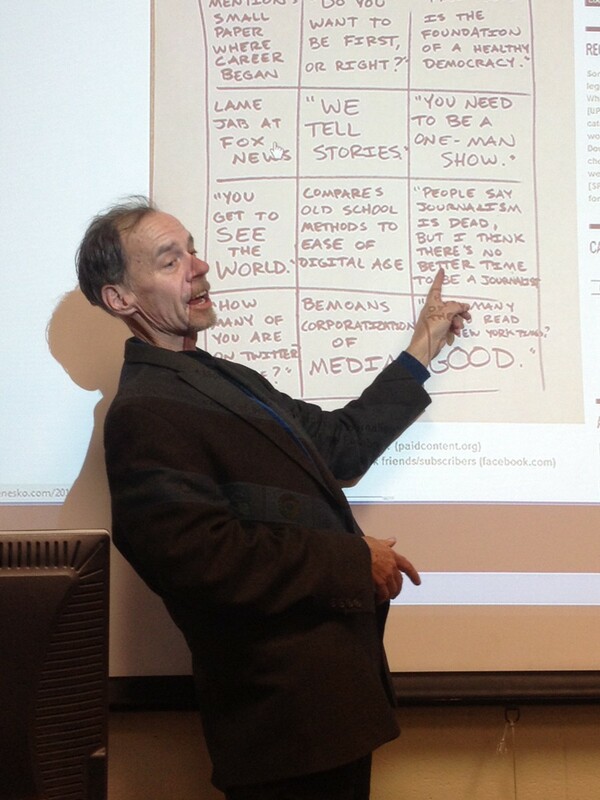 He wanted us to learn and to be good reporters. When the scandal regarding Bill Cosby and the alleged rapes emerged, David wrote a piece denouncing himself as one of the many enablers in the media that had kept it a secret for so long. He showed us how to be brave, how to speak our minds and keep our integrity as journalists. Carr took the time to meticulously edit our work, whether he did it from a plane, train, or his bed in New Jersey, which he described as surrounded by stacks of oldNew Yorkers and books authored by friends he meant to get around to reading. He just loved TV so much, he said. Carr always seemed honest to a fault. It’s scary to be a young journalist. Many people tell you it’s a terrible field to get into. Carr always touted its importance and gave us hope, holding us to high standards and championing hard work. Carr’s professionalism in the field, eagerness to learn, and love for the Times were all reasons for us to do better. David impressed his colleagues as well. I knew from the search process that there was a certain amount of skepticism on campus. In fact, David was a worker. He made it to classes, and he even made it to faculty meetings — a duty that a lot of veteran professors routinely blow off. For anyone who knew David, none of this would come as any surprise. All his life, he outperformed. He understood in a deep way the essence of the internet: you get by giving. Last time I heard from him was last weekend. He wanted to chat because he had pneumonia, and he was worried about having to miss class. He felt terrible about that, and he wanted to explore options: could he get a sub? Could he make it up later? What do professors do? I tried to reassure him, and then he shot me an email the next day: he was feeling better, so never mind. He was going to soldier on. on mend. coming monday am, weather permitting. 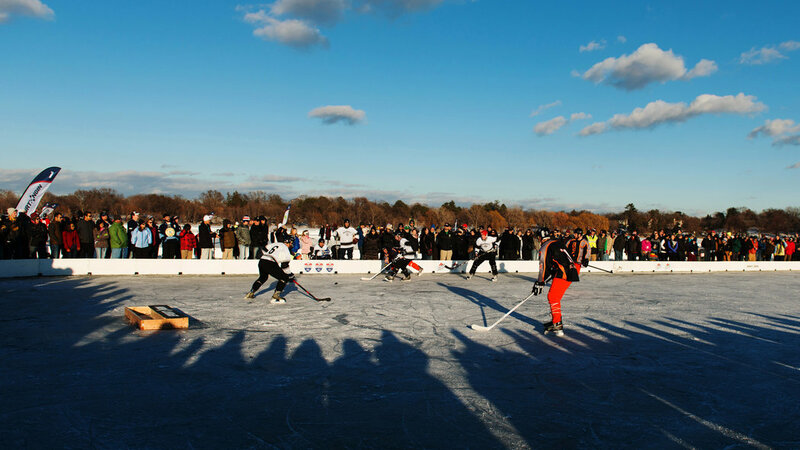 Thanks to the New York Times for (finally) recognizing one of the truly great winter sports — pond hockey. Not the professional kind, played in a rink with endless body-checking and regular fistfights. I am talking about hockey played on a frozen pond, with no refs, no boards, no checking, and no fighting. To my way of thinking, playing on a pond distills the essence of hockey — a game of flow that emphasizes skating, stick-handling, and teamwork. Here’s an essay I wrote a while back celebrating the joys of skating on New England’s ponds. Enjoy, then lace ’em up! Cronkite didn’t do it all alone: RIP, Sandy Socolow. Let us note the passing of one of those people you never hear about who work behind the scenes to make sure the news keeps coming to you. Today’s Times brings news of the death of Sandy Socolow, the longtime CBS News exec who produced many of Walter Cronkite’s shining moments. Mr. Socolow worked for CBS almost without interruption from the mid-1950s until 1988. He arrived as a writer for the morning news and shortly thereafter began working with Cronkite, first on a midday news program and later on “Eyewitness to History,” a series of news specials that evolved into a weekly prime-time half-hour that lasted until the “CBS Evening News,” with Cronkite in the anchor seat, expanded to 30 minutes, from 15, in 1963. For several years Mr. Socolow was a co-producer of the “Evening News,” in charge of, among other things, Vietnam coverage; according to CBS, he was the New York segment producer of the shocking 1965 report by Morley Safer that showed American Marines setting fire to Cam Ne, a village near Da Nang, and that helped awaken Americans to the escalating calamity of the war. Mr. Socolow produced Cronkite’s coverage of the moon landing in 1969. In 1971 he hired the program’s first female producer, Linda Mason. He became vice president, deputy news director and executive editor of CBS News in New York, and in 1972 was involved in one of the news division’s most controversial episodes. Less than two weeks before the presidential election, the “Evening News” broadcast Cronkite’s two-part summation of the unfolding Watergate story, largely following the reporting in The Washington Post by Carl Bernstein and Bob Woodward. 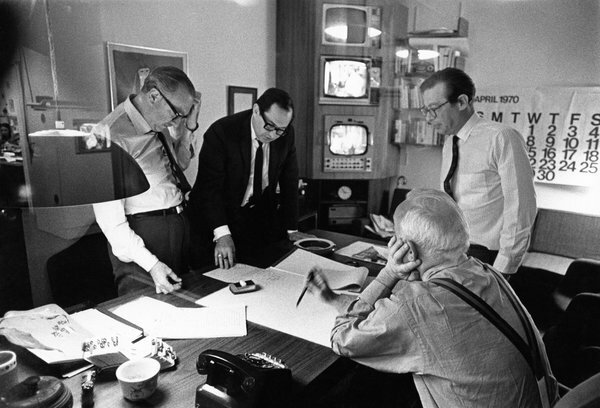 Sandy Socolow, second from left, with Walter Cronkite, left, in 1970. The two later worked together on coverage of the Watergate scandal. Place your bets! When will NYT hit 1m digital subscribers? 1. Digital advertising revenue is up! 2. Paid digital subscribers are up! In today’s story, you have to hunt to find the good news, buried under the usual gloomy headline about the NYTCo’s overall performance. The main headline is — as usual — that profits slipped a tiny bit, mainly because of the continuing inevitable endless decline in print advertising and a small downturn in the money coming in from people who pay for the print edition. So what? –The number of people who pay to subscribe to the Times online rose soared from 760,000 a year earlier to 910,000 at the end of 2014. That’s an increase of 150,000 new, paying customers, or 20 percent! When you look at that part of the business — which is, after all, the future — the Times looks very much like a going concern. In fact, the Times‘ executive in charge of the business side, Mark Thompson, stuck his neck out and predicted that the Times will reach the 1 million milestone in paid online readers sometime in 2015. Care to wager on what day that will happen? And, for perspective, here is the 10-year chart of the NYTCO’s stock performance. Two things strike me. It’s hard not to notice that the stock plummeted in the Great Recession and that the Times is now up off the mat and fighting back. I now wish I had had the courage to buy some in 2009 — I could have doubled my money!